Early experiences with science can help children develop the problem-solving skills they need for life. What do we know about supporting family science? Young children are born scientists. Every time they make mud, build a block tower, or examine a leaf, they are investigating how the world works and building critical-thinking skills. Parents and caregivers can play an important role in helping to encourage children’s scientific investigations. But little is known about parents’ comfort level in talking about and doing science with their children. What Parents Talk About When They Talk About Learning: A National Survey About Young Children and Science, a new report from EDC and SRI International, explores parental involvement in children’s early science experiences. 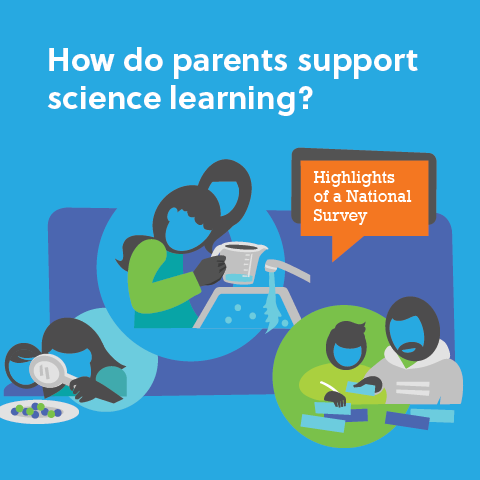 The results of this first-of-its-kind study offer a clear window into parents’ perceptions of early science learning at home and the opportunities that exist for improvement. The study was commissioned by the U.S. Department of Education’s Ready To Learn initiative and led by the Corporation for Public Broadcasting and PBS. EDC and SRI International are long-standing evaluation partners for Ready To Learn. 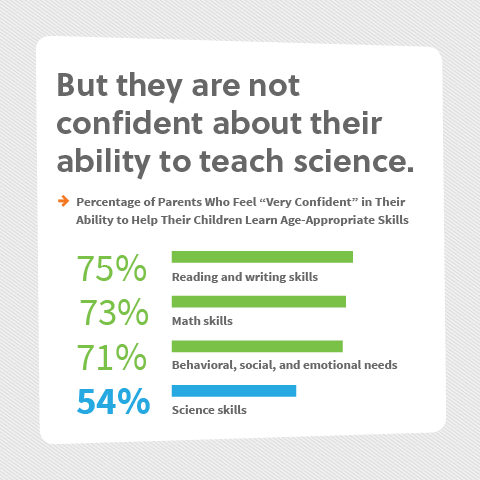 Most parents say they are confident about their ability to teach their young children literacy, math, and social skills, but fewer parents are confident about teaching science. Parents with less formal education are less likely to feel confident in helping their children learn than are parents with more education. Nine out of 10 parents report doing learning activities with their children daily. 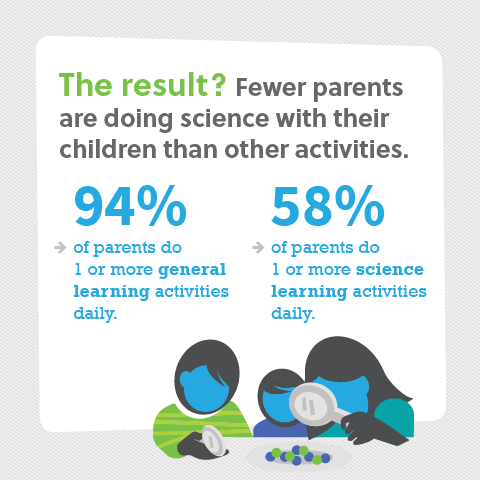 About half of parents report doing science-related activities with their children daily. Seven of 10 parents say that knowing what young children need to learn about science, and having ideas for doing science with everyday materials, would help them do a lot more science. Many families say they use science media weekly or more—particularly videos or TV shows about science—but few parents think these media resources have helped their children learn a lot of science. 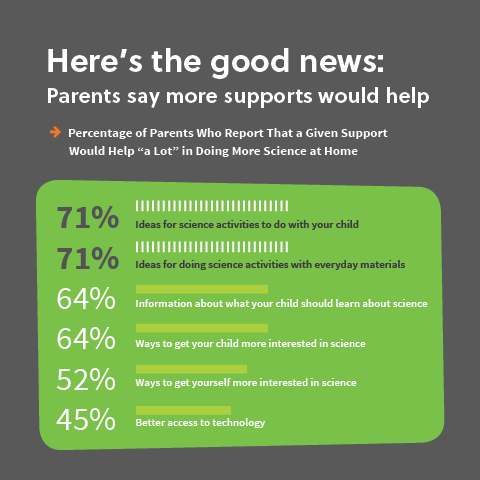 Parents want to do more science with their young children—and they want help. Here are five ideas for educators and media producers interested in helping parents do more science at home. Parents don’t have to know the “right answer” to help their children learn science. Parents can build on children’s natural curiosity by asking questions and looking for answers together. Science exploration can start with wondering aloud. It can be reinforced with materials tailor-made for families. Parents need ideas about how to do science in ways that easily integrate with their routines and that don’t require special materials or lots of time. Science is for home, school, and all the places in between. Preschools, schools, and teachers must emphasize that science is critical for the early years, both in early education settings as well as at home. Science is watchable, readable, playable, and doable. Media producers can engage families by developing resources for both parents and children that include clear, high-quality, developmentally appropriate science content that models ways to engage with science concepts, practices, and activities. Science learning should be accessible to all. It is imperative for educators and media producers to lower the barriers that parents face in helping their children learn science.